at her mother’s side, half a continent away. after many years of being apart. But eventually old patterns emerged. Lynn went to see a counselor. “to my mother’s sense of perfection. in our roles as caregivers. a few spots to appear here and there? some casual disorder now and then? with our natural, God-given fallibility? where exactness matters not at all? as being hopefully, blissfully, genuinely human? 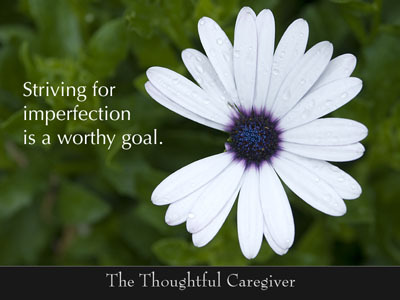 This entry was posted on January 21, 2008 at 9:36 am and is filed under Caregiver Truths, Caregiving, Caregiving & Feelings, The Possibilities. You can follow any responses to this entry through the RSS 2.0 feed. You can leave a response, or trackback from your own site. P.S. I have a “place”! It’s just a landing in front of the attic stairs but I fixed it up and put nice curtains on the window, a rocking chair and small table for my Bible and some tea. I love it and my husband says he wants his own space now. Thanks again.